(Nanowerk News) A ‘one-step’ coating that blocks protein growth and kills surface-bound bacteria on silicone may significantly reduce infections from medical devices such as catheters, finds a study led by A*STAR Institute of Bioengineering and Nanotechnology researchers. 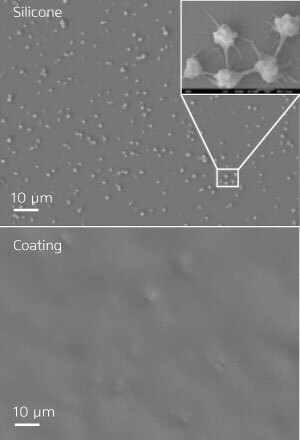 Yi Yan Yang and international co-workers accomplished this with a synthetic technique that combines biomimetic surface adhesion and antimicrobial capabilities into a brush-like polymer film ("Brush-Like Polycarbonates Containing Dopamine, Cations, and PEG Providing a Broad-Spectrum, Antibacterial, and Antifouling Surface via One-Step Coating"). Implanting foreign materials into biological environments inevitably leads to accumulation, or ‘fouling’, of surfaces with pathogenic biomolecules. To block this film growth, researchers from the Institute of Bioengineering and Nanotechnology are experimenting with coatings known as ‘polymer brushes’ — arrays of macromolecular chains that bind to surfaces and modify properties such as bioadhesion. One popular coating is called poly(ethylene) glycol (PEG), a soft, water-soluble material often used in drug delivery. Chemists can easily modify the structure of PEG for grafting onto device surfaces, where it provides a strong physical barrier against biomolecule adsorption. However, as PEG has no antimicrobial abilities, with time bacteria can overcome the PEG films and grow onto the surface. Yang and co-workers are working to improve polymer brushes using biodegradable materials called aliphatic polycarbonates. Recently, they developed a ‘living’ ring-opening polymerization that can attach antimicrobial molecular units and PEG chains to the polycarbonate backbone with high precision. Experiments revealed that catheters coated with this polycarbonate–PEG film eradicated Staphylococcus bacteria and had excellent blood compatibility. However, it failed to prevent fouling from one of the most dangerous pathogens in hospitals — Escherichia coli bacteria. Now, the researchers have developed a polymer brush with broad-spectrum antibacterial capabilities and a simplified coating process. They added three key components to the polycarbonate backbone: effective antimicrobial cations, PEG chains for antifouling, and dopamine groups that stick to silicone rubber in a manner similar to adhesive proteins found in mussel shells. Linking the three components into a single polymer, however, required chemical ingenuity in the form of co-interacting, metal-free catalysts. The polymer’s dopamine groups allowed attachment to catheter surfaces through a single-step dipping procedure. Imaging tests showed that the film killed both Staphylococcus and E. coli bacteria upon contact, and prevented these pathogens from establishing fouling layers (see image). Yang notes that these findings, in combination with the coating’s stability under simulated blood flow, indicate this approach’s potential for preventing infection in intravascular catheters.